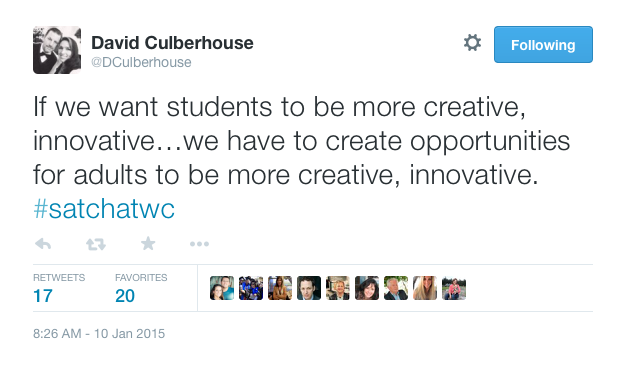 This weekend I came across a Tweet from David Culberhouse from a conversation discussing innovation and creativity. As teachers in our building are exploring ways in which we can increase opportunities to collaborate this particular Tweet resonated with me. Teachers at our school are moving their Professional Development in this direction. Their most recent day was extremely uplifting to say the least. It opened with a very brief presentation to the whole group and then we had EdCamp style breakout discussions. No one came with presentations, and everyone came with ideas and thoughts. One of the moments in the day that stuck out for me happened during the opening preview to the day when one teacher very directly told his colleagues that innovation and change does not mean what you were doing was bad or wrong. This struck a cord with me because although innovation is a word that is used often in Education (as well as many other fields) there is still a lot of systemic pressure within schools to innovate or change cautiously. I remember a colleague several years ago challenging an idea of mine by telling me that the kids aren’t guinea pigs. She was absolutely correct. And because of this, I agree that we need to give careful thought as we try new things but to me innovation is about trying and learning new ideas. Creating something better than what we have had before. By improving things for learning we are in fact being innovative and in many cases we are making good things better. There are so many great pockets of innovation in Schools and Districts where amazing new work is challenging past norms. Unfortunately as a system we are still only limited to pockets. So while it is important to move cautiously we should remember cautious does not have to mean slow. We need to take leaps where things are working well. There is a need for us to be creative in how we approach learning and create new opportunities for kids. Why is there a need to innovate? We know that our system has many demands for a limited number of resources. It is important to continue to advocate for greater support of education. We also know that people can learn anytime and anywhere. Will Richardson shares a great story in a Ted Talk about his daughter teaching herself how to play Journey’s “Don’t Stop Believing” from watching a video. Her piano teacher was distraught because “she wasn’t ready”. Richardson is not suggesting we no longer need teachers – he is pointing out that teaching and more importantly learning looks very different than it has in the past. If people are learning differently then we need to create different opportunities to meet these changing needs. The power of connections and professional conversations is helping to spread the great work that is happening within the pockets mentioned earlier but the culture of “can we try this” exists in many schools. We need to shift that mindset to “how can we try this” in order turn those isolated examples into the new norm. To do this we need to provide opportunities for kids to try different things than we tried when I was a kid in school. If you are teaching the same book you read 10, 20 or even 30 years ago – stop and ask why. Maybe there is a good reason, but with an unlimited access to other materials it is unlikely that all 25 to 30 kids in your class all want to learn, think and read the same things. If we want to make these changes on a larger scale then as leaders we need to think and act more creatively than we have in the past. We need to take measured risks and model an innovative and progressive approach to implementing the changes that our communities are asking for. If we don’t change the way we operate, it will be difficult to see the changes we are hoping for.